With over 300,000 domains registered and a huge customer base, InMotion Hosting must be doing something right. 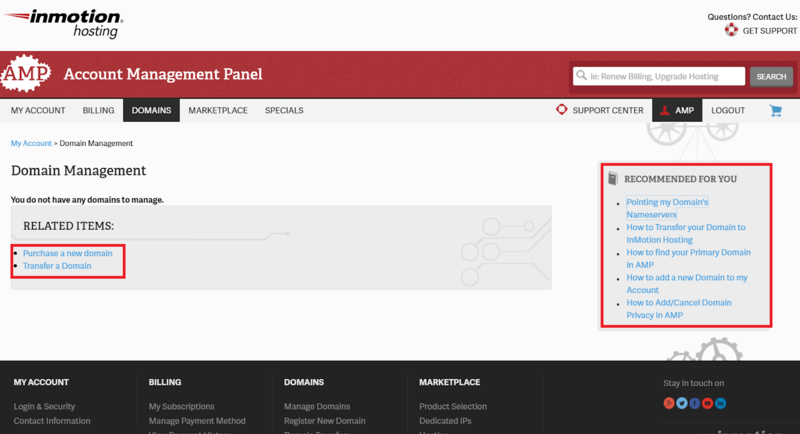 However, you do need to keep in mind that InMotion uses the cPanel control panel. If you haven’t worked with it before, there can be a bit of a learning curve. Even if you are familiar with it, you may be wondering how it will work with InMotion’s own Account Management Panel (AMP). In this step-by-step guide, I’ll show you the entire process of installing WordPress, connecting a domain, and setting up a CDN. If you want to know what else to expect from InMotion Hosting, read my full InMotion Hosting review. Luckily, you don’t need to do much to connect your domain. All you have to do is point your DNS records to InMotion’s nameservers. Just keep in mind that the changes may take up to 24 hours to take effect. When you sign up, one of your onboarding emails will contain info on how to connect your domain, but you can also find a link in your Domain Management dashboard in the AMP. The article includes detailed information about how the InMotion Hosting DNS works. At the bottom, you’ll find links on how to change your DNS records using popular registrars like GoDaddy, Dotster, or Google Domains. When I signed up , I didn’t opt to have WordPress installed automatically, since I wanted to see how easy the process would be from within the dashboard. However, this is a convenient option which I recommend taking advantage of. The PDFs in the emails you receive don’t cover this process, but you’ll find a link to the WordPress 101 support document where all the steps are explained. Although the documentation is very thorough, it’s not the easiest read. However, if you’ve installed WordPress this way before, you’ll find the process fairly straightforward. You’ll need to fill in a few fields on the next page to install WordPress correctly. The default settings should be fine, but there are a few vital settings you need to confirm, such as your website name, domain, and so on. At the bottom of the page, you can also enable/disable a few options (you don’t have to worry too much about these if you don’t know what they are, and the defaults should be fine). You’ll also have the option to automatically install WooCommerce, which is one of the best e-commerce plugins for WordPress. InMotion Hosting includes an image CDN with lower-tier WordPress packages and both an image and video CDN with higher-tier packages. You can get access to both via the Jetpack plugin installed on your WordPress site. If you need a CDN with a broader scope, you’ll need to set it up with a third-party service, such as Cloudflare. The Jetpack plugin will be installed and set up automatically on your site, so you don’t need to worry about configuring it. It’ll also be licensed according to your plan, so you get the level of service you are entitled to without having to license it yourself. Alternatively, you can purchase a Jetpack license without upgrading your hosting package, but then you’ll need to do that through the Jetpack website and then connect the plugin to your Jetpack account. InMotion Hosting takes care of the most complex and time-consuming parts of setting up your website. Unlike with many other cPanel-based hosts, you don’t need to dig around to connect your domain, and you don’t have to do a thing to set up your CDN. The only thing you might find tricky is installing WordPress, but if you’re familiar with cPanel, this shouldn’t be a problem. The process is straightforward and shouldn’t take more than 30 minutes. Of course, you can always get around it by having WordPress and BoldGrid automatically installed when you purchase your hosting plan. If you’re not a fan of cPanel, I would recommend GoDaddy. It’s also affordably priced easy to set up, but it offers an intuitive custom-built management dashboard. You can read more about InMotion Hosting and what it has to offer in my in-depth review.